Castello del Buonconsiglio in Trento. Discover Lake Garda! 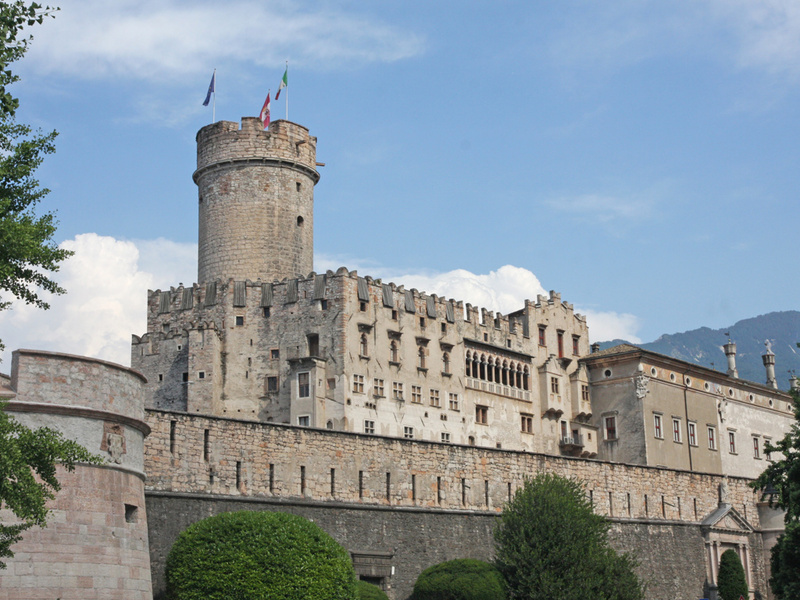 North of Lake Garda, on a rocky hill in the middle of the city of Trento, stands the castle Castello del Buonconsiglio. It was built in several stages of construction at the beginning of the 13th century as an imperial retreat, and therefore today consists of sections of buildings from different eras. A stately outer ring wall surrounds the castle with its stylish gardens. The oldest part is the ancient city wall with the defence tower, and the Castelvecchio completed under Friedrich of Wangen in 1239. In 1475, Prince-Bishop Johannes Hinderbach commissioned the construction of the Venetian Loggia, which offers a fantastic view over the old town of Trento, as well as the early-Renaissance arcaded courtyard. Bernhard von Cles built a new, larger building, the Palazzo Magno and the new outer ring walls. Prince-Bishop Alberti Poia closed the gap between the two palaces with the Giunta Albertiana. Large parts of the castle were damaged during the occupation of Napoleon and Austria and their misappropriation of the palace as barracks. After extensive restoration, it's presented today in its former splendour. The colourful frescoes in the castle, like the valuable cycles in the eagle tower, are especially worth seeing. A passageway along the city wall leads to the tower, which was commissioned by Prince-Bishop Georg I of Liechtenstein by a painter from the north. The resulting frescoes with pictures representing the months, illustrate with decadal details the pleasurable life of the nobles in addition to the dutiful existence of the peasants during the course of the seasons. You can visit the eagle tower as part of a guided tour. In addition to the precious frescoes, the castle houses collections of the National Museum. These include memorials and writings, 15th-century music, a 9th-century Gospel book and a 9th-century Gregorian liturgical codex, as well as Carolingian sculptures, paintings, frescoes and drawings. The archaeological section shows findings from the Bronze and Iron Age.